If you are wondering how to get from Copenhagen Central Station to Stockholm Central Station by SJ train then you are in luck. My Day 4, Part 1 recap of my trip to Denmark and Sweden will cover this very issue. I decided to break down my day 4 recap into two parts. On this day, I traveled from Copenhagen to Stockholm and spent half a day wandering around old town Stockholm. Part 1 will show you how I traveled on the SJ train from Copenhagen to Stockholm while. Part 2 will recap the rest of my day walking around the wonderful and historic old town of Stockholm. The first and easiest option for purchasing tickets for the SJ train is by purchasing them online directly from the SJ website. You can purchase tickets by visiting http://www.sj.se/travel/booksearchlocation.form?l=en. Tickets for the SJ train are a lot like airplane tickets. Pricing is dynamic so you can expect to see an increase in price as you get closer to your travel date and as more seats are booked. So, make sure you book your tickets as soon as possible to avoid overpaying. After making your online ticket purchase, you will receive an email with your attached E-ticket(s). All you need to do now is simply print your tickets and bring them along with you on your day of travel. Your E-ticket or biljett will look similar to the one posted above. As you might have noticed, the train ticket is in Swedish. I will now break down each section to help you better understand what each section of the ticket means. The E-ticket was separated into two tickets with a unique biljettnummer, or ticket number. The first ticket was for travel from København H (Copenhagen Central Station) to Malmö C (Malmö Central Station). 2 kl : 2nd class seat. If you choose 1st class, it should say 1 kl in this location. Öresundståg: the name of the type of train. On this first train, there was no assigned seating. The second ticket was for travel from Malmö C (Malmö Central Station) to Stockholm C (Stockholm Central Station). Snabbtåg: the name of the SJ high speed train. The SJ train had assigned seats. My seat was assigned in wagon 13, seat 54. You can also purchase SJ train tickets by visiting one of the ticket machines inside Copenhagen Central Station. There were three ticket machines in the station: two at the main entrance on Banegardplatsen and a third near the exit towards Tivoli Gardens. These machines are great for those who need to purchase same day tickets. The ticket machines accepted credit cards and debit cards only. Since I already had a ticket in hand, I was unable to test if any international credit cards worked. I wouldn’t be surprised if they did not, as a pin was required other times I tried to use my credit card for train tickets. International debit cards, such as a Bank of America or Chase debit card with pin should work without any issues. Since I purchased my ticket online, I had no need to purchase a ticket from this machine. If your printed ticket is also in Swedish, which I assume it should be, just refer to the above section if you need any help translating the information to English. As I mentioned before, for my journey from Copenhagen to Stockholm, I decided to travel 2nd class with a connection in Malmö. There were options for getting to Stockholm without making a connection, but on the day I traveled, it was much cheaper with a connection. My first train was a quick ride on the Öresundståg train from Copenhagen Central Station to Malmö Central Station. The ride was scheduled to be 34 minutes. When I arrived at the train station in Copenhagen, I was a little confused. According to my ticket, my train number was 1012. I could not find any reference to train 1012 on any of the departure screens at the station. Luckily, there was only one train leaving at the departure time of 6:12AM from track 6, so I knew this had to be the train. When I arrived at track 6, I was a little confused once again. I needed to go to Malmö and the screen showed Växjö, a city in Sweden. When I looked closer at the bottom part of the screen, I noticed an easy to miss list of stations. The listed stations were those where the train would make brief stops at prior to arriving at Växjö. The 6th stop was Malmö C, so I knew this was the correct train. With no assigned seats on this Öresundståg train, I boarded the train and sat in the first open seat that I saw. Since the train from Copenhagen to Malmö was a short one, I sat in a seat near the door. The train wasn’t full, so I had room to place by bag next to my seat. There was also ample overhead storage available for carry-on sized bags. I didn’t happen to see any dedicated storage space for larger bags, but there was a standing area near the door where people with larger bags could stand. 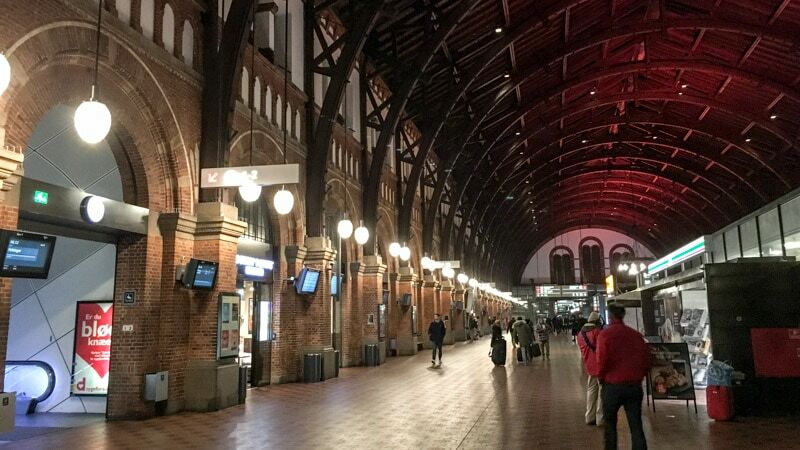 If you will be connecting in Malmö like I did, make sure you are prepared to exit the train with your luggage as the train only made a brief stop in Malmö and continued on to other destinations in Sweden. After a quick ride across the Øresund Bridge connecting Denmark and Sweeden, the train pulled into Malmö Central Station. When I exited the train and walked into the station, I repeated the same process of trying to figure out which track I needed to be at and which train I needed to board. It was a long walk down the platform, but I finally reached wagon 13. Just as with the prior train, there was ample storage room above each seat for carry-on sized bags. The seats on the SJ high speed train were quite large. A lever under each seat could be used to recline the seat, making the ride a lot more comfortable. For those who needed power, there was a power plug between each seat. This plug came in handy for recharging my laptop and iPhone during the train ride through the countryside of Sweden. After 4.5 hours, I could finally see the city of Stockholm. I was excited to be in a new country ready to start a new adventure. Welcome to Stockholm Central Station. I was now ready to wander the old town of Stockholm. You can read about this in my Day 4, Part 2 recap.